Director/Screenplay – Brad Bird, Producers – Nicole Paradis Grindle & John Walker, Photography (3D) – Mahyar Abousaeedi, Music – Michael Giacchino, Production Design – Ralph Eggleston. Production Company – Pixar Animation Studios. The Incredibles go into action to stop a super-villain known as The Underminer attempting to rob a bank with his drilling mole. The damage caused results in the government shutting down their support program. They then receive an offer of aid from tech billionaire Winston Deavor, a fan of theirs who wants to bring back superheroes. He has a plan to do so by marketing them and chooses Elastigirl as the public face of the campaign. Deavor outfits her with a hi-tech motorcycle and sends her out to fight crime. Great success is had when she saves the mayor aboard a runaway monorail. However, she comes up against a new villain known as The Screenslaver who can control the minds of others from out of tv screens. Having to stay home and look after the children, Bob feels left out. Violet decides she hates him when she finds that government agents blanked the memory of Tony Rydinger, a boy she likes, after he accidentally discovered her identity. At the same time, Bob discovers that young Jack-Jack is developing superpowers that are capable of wreaking havoc. 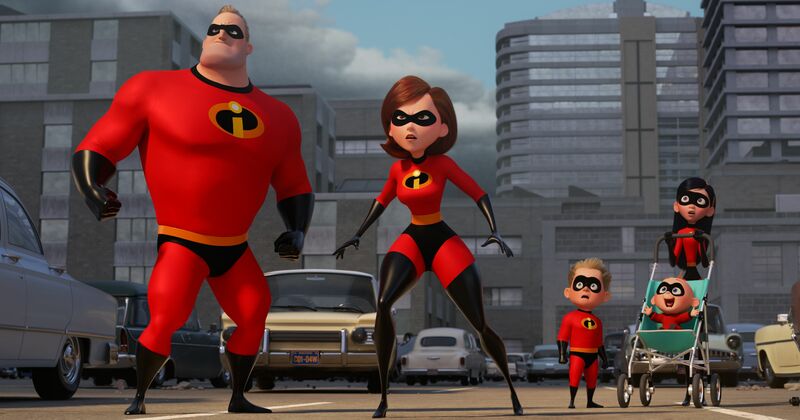 The Incredibles (2004) was one of the huge hits that came from the heyday of Pixar between 1995 and 2010. It was a time when it seemed that almost nothing that Pixar did could go wrong, a period featuring hits such as Toy Story (1995), A Bug’s Life (1998), Toy Story 2 (1999), Monsters, Inc. (2001), Finding Nemo (2003), Cars (2006), Wall-E (2008) and Up (2009). The Incredibles was made by Brad Bird who started out working for Steven Spielberg’s Amblin production company, where he made the famous Family Dog animated episode of the anthology tv series Amazing Stories (1985-6), plus also co-wrote the script for the Spielberg-produced Batteries Not Included (1987). Bird’s breakthrough was with his first animated feature film The Iron Giant (1999), which proved a box-office disappointment despite receiving universal rave reviews. Bird bounced back from this after being brought into the Pixar fold to make The Incredibles. Subsequent to that, Bird would go onto direct Ratatouille (2007) for Pixar and then made his live-action directorial debut with Mission: Impossible – Ghost Protocol (2011), followed by Tomorrowland (2015). Come the 2010s, Pixar won back the right to sequelise their own films from Disney after a hard-fought battle. This took them off along another path, one where the studio seems more interested in producing material banked on previous successes than it does in creating original content. The sequels made during this period include Toy Story 3 (2010), Cars 2 (2011), Monsters University (2013), Finding Dory (2016), Cars 3 (2017) and the upcoming Toy Story 4 (2019), all of which, while not unenjoyable in most cases, are lesser works than their predecessors. Original films such as Brave (2012) and The Good Dinosaur (2015) have fared far less successfully. While the likes of Inside Out (2015) and Coco (2017) show improvement, they still don’t hit the same heights Pixar did during their heyday. I had a lot of hopes for Incredibles 2. I have always liked Brad Bird’s work ever since Family Dog. The Iron Giant and The Incredibles are standout works, Ratatouille slightly less so. Bird did a superlative job venturing into live-action with Mission: Impossible – Ghost Protocol, the best of the Mission: Impossible films. However, his live-action follow-up Tomorrowland universally disappointed and earned back well under half of what it cost to make – Incredibles 2 feels like Bird making a return to familiar territory after the critical drubbing taken by Tomorrowland. (Indeed, the Pixar old guard seem to be taking a bit of a battering in the real world in the 2010s with Andrew Stanton still with tail between his legs after the flop of his live-action venture John Carter (2012), while Pixar founder John Lasseter has been ousted from his CEO-ship and seat at the Disney board over sexual harassment charges). I wanted to like Incredible 2. And when it starts in, the same sense of fun the original had is there in a hugely entertaining sequence with the family going in to action to stop a super-villain with an out-of-control drilling mole. Bird again pulls off the superheroics with appealingly over-the-top comedic sequences. There are several of these throughout – one with Elastigirl setting out to stop the runaway monorail; and the various scenes with Bob trying to deal with Jack-Jack’s development of superpowers (although given the massively destructive potential of some of these, I think I’d be more fearful as a parent than the delight with which Bob greets such). The sequel also amplifies the Googie design scheme that was in the background of the first film and expands it to the look of much of the film. Of all the various Pixar sequels, excepting maybe Toy Story 3, Incredibles 2 would have to be the one that audiences looked forward to the most and which seemed to hold the potential to not be another Pixar disappointment. However, the sad truth is that it does disappoint. The characters, the same voice actors, the action scenes are all there and during each individual scene one sat enjoying them. It is just that they never seem to come together as a united whole. The plot suffers from the feeling that each of the central characters had to be given a storyline on their own. 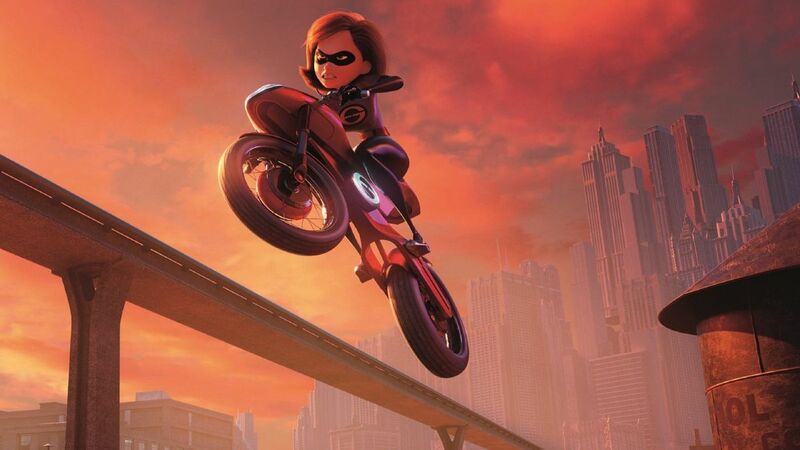 Elastigirl is fine but Bob is reduced to the cliche of the comically inept father trying to deal with a chaotic kid. It feels exactly like the superheroic equivalent of a bunch of action films where the stars deflate their tough guy persona by playing off kids – see examples like Kindergarten Cop (1990), Mr Nanny (1992), The Pacifier (2005), The Game Plan (2007) and The Spy Next Door (2010). These add up to amusing enough sequences on their own but nothing that manages to soar with the charms of the original.